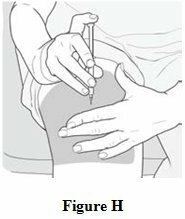 Injection: 40 mg per mL in a single-dose, prefilled syringe with a light blue plunger. 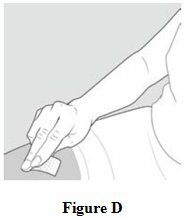 For subcutaneous use only. 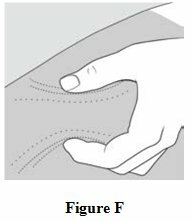 Infrequent:Hypotension, midsystolic click, systolic murmur, atrial fibrillation, bradycardia, fourth heart sound, postural hypotension, and varicose veins. Glatiramer acetate is a clear, colorless to slightly yellow, sterile, nonpyrogenic solution for subcutaneous injection. Each 1 mL of glatiramer acetate solution contains 40 mg of glatiramer acetate and the following inactive ingredient: 40 mg of mannitol. The pH of the solutions is approximately 5.5 to 7.0. The biological activity of glatiramer acetate is determined by its ability to block the induction of experimental autoimmune encephalomyelitis (EAE) in mice. 40 mg/mL in a single-dose prefilled syringe with a light blue plunger, in individual blister packages supplied in 12-count cartons (NDC 0378-6961-12). 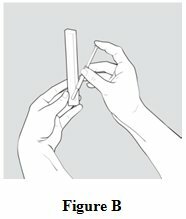 Instructions for Use: Instruct patients to read the glatiramer acetate injection Patient Information leaflet carefully. Glatiramer acetate injection 20 mg per mL and glatiramer acetate injection 40 mg per mL are not interchangeable. 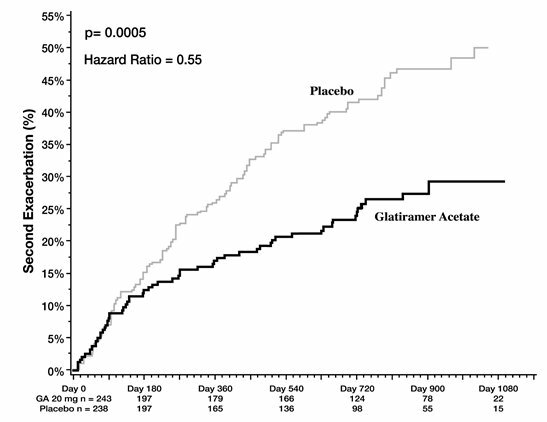 Glatiramer acetate injection 40 mg per mL is administered three times per week. Caution patients to use aseptic technique. 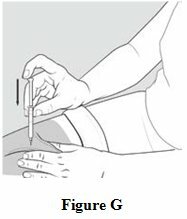 The first injection should be performed under the supervision of a health care professional. 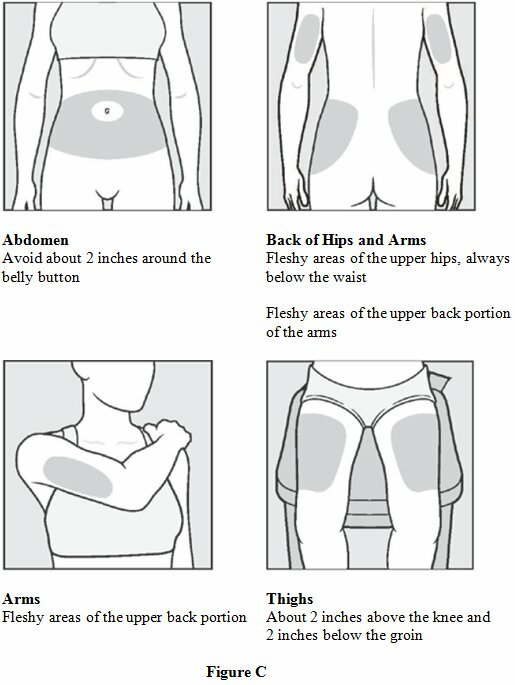 Instruct patients to rotate injection areas and sites with each injection. 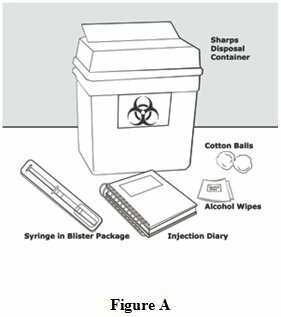 Caution patients against the reuse of needles or syringes. 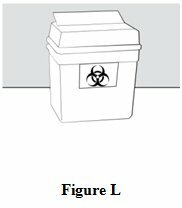 Instruct patients in safe disposal procedures. For detailed instructions, see the Instructions for Use at the end of this leaflet for complete information on how to use glatiramer acetate injection. Store glatiramer acetate injection in the refrigerator between 2° to 8°C (36° to 46°F). 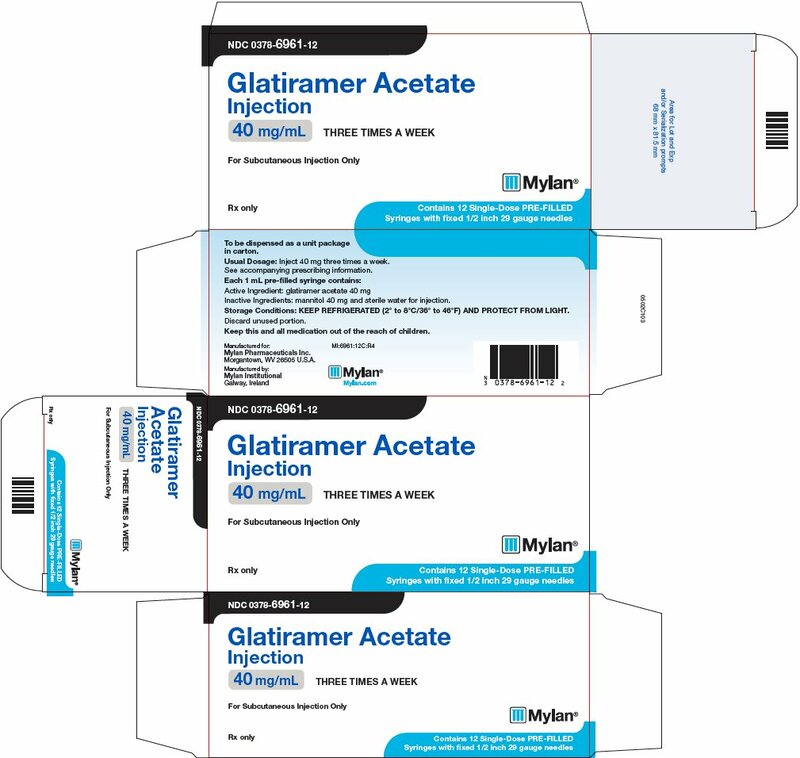 When you are not able to refrigerate glatiramer acetate injection, you may store it for up to 1 month at room temperature between 15° to 30°C (59° to 86°F). 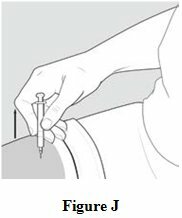 Glatiramer acetate injection comes in a 40 mg prefilled syringe with needle attached. How often a dose is given depends on the product strength that is prescribed. Your doctor will prescribe the correct dose for you. 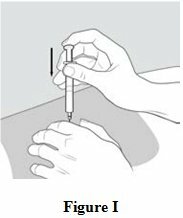 Glatiramer acetate injection 40 mg is injected 3 times each week in the fatty layer under your skin (subcutaneously). Glatiramer acetate injection 40 mg should be given on the same 3 days each week, if possible for example, Monday, Wednesday, and Friday. 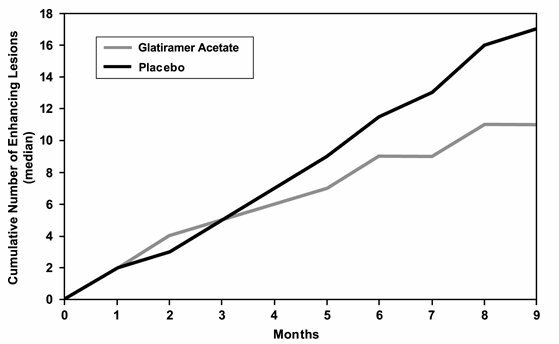 Give your glatiramer acetate injections at least 48 hours (2 days) apart. Each glatiramer acetate 40 mg prefilled syringe is for single use (1 time use) only. The glatiramer acetate injection 40 mg dose is packaged in boxes of 12 prefilled syringes with needles attached. Glatiramer acetate 40 mg prefilled syringes have light blue plungers. Step 2: Remove only 1 blister pack from the glatiramer acetate prefilled syringe carton. See Figure B. Usual Dosage: Inject 40 mg three times a week. Storage Conditions: KEEP REFRIGERATED (2° to 8°C/36° to 46°F) AND PROTECT FROM LIGHT.